Note: I don't know if you would consider a double feature a marathon... but figured this is the best place for it. 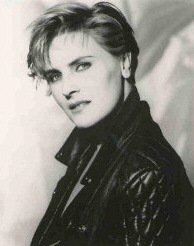 A member of the Crosby family entertainment dynasty, Bing's granddaughter Denise Crosby has worked steadily in film and television since the late '80s, though it would be fair to say almost wholly within the science fiction B-industry (Mutant Species ). Her recurrent appearances on television's Star Trek: The Next Generation, Red Shoe Diaries, and a role in the blockbuster Deep Impact (1998) have contributed toward bringing the quintessential "working actor" to wider audiences. She was once married to Geoffrey Edwards, son of director Blake Edwards. In the small town of Santa Loraina, California, the decrepit, long-abandoned Fowler Funeral Home has become a local legend. As the story tells it, Zeb Fowler bought the land to start up a ranching business, but something killed off all the cattle. To make ends meet, Zeb became the town mortician, and the Fowler house was turned into a funeral home - complete with a cemetery for a yard. But the strangest part of the story is the Fowler's son Bobby, whose face was so hideously disfigured it was hidden beneath a burial shroud. At age eight, Bobby mysteriously vanished, and ten years later his parents were found murdered - their faces smashed in. Locals believe that Bobby is still alive. Today, the Fowler Funeral Home is the stuff nightmares are made of - backed-up sewage pooling the yard, a house of filth, decay, coffins, embalming equipment, and a strange black fungus growing on everything - and now the Doyle family is moving in. I blind bought this movie last week without even realizing that it had Denise Crosby in it. I thought this was a good movie.... I actually enjoyed it a lot. But it did do one thing that I didn't like... it left me still with a major question... basically it didn't answer what it was that was effecting the people. But then again there is a lot of horror movies that do the same... leave a big question mark on how or why. There is a few nice extras on this DVD. Other then the theatrical trailer (and promotional trailers) there is a making of and a commentary track. I have the commentary on now as I type this to see if it is explained any more... but I am doubting it at this point. But over all I am glad I added this one to my collection... definitely a different take on a zombie movie. I found it interesting that the zombies wasn't actually go after people to eat them. OK... After watching the movie for a second straight time... this time with the commentary on...the questions I have was still not answered. And OMG... I think this is the first commentary I ever watched with Tobe Hooper... He is a bit of a mumbler... was even hard to understand a couple times! But I am not to disappointed in not getting my questions answered... because those kinds of questions don't get answered in horror movies a lot of times... you just have to take it for what it is. After moving to an idyllic home in the countryside, life seems perfect for the Creed family... but not for long. 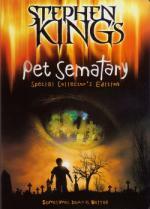 Louis and Rachel Creed and their two young children settle in to a house that sits next door to a pet cemetery - built on ancient Indian burial ground. Their mysterious new neighbor, Jud Crandall (FRED GWYNNE), hides the cemetery's darkest secret... until a family tragedy brings the secret to life. Now, an unthinkable evil is about to be resurrected. From STEPHEN KING, the Master of the Macabre, comes a journey that leads to hell and back. Though not everyone survives the trip. For the Creeds, home is where the horror is. This is one of my all time favorite horror movies. As with most of the Stephen King movies... Stephen King himself has a cameo in the movie. This time as the preacher at the funeral for Mrs. Dandridge... the woman that helped the creed family in the beginning of the movie. This movie is one of the few movies that can make me cringe when watching it. actually from 2 things in the movie. First when Jud gets the back of his ankle sliced... the next when he is sliced across both cheeks when he is screaming. Both those look extremely painful to me. I couldn't even imagine. Not to mention.. this is a true horror movie for any parent. It even effected me... I had a time watching this movie when my daughter was about Gage's age... especially considering I live on a road that has a high school just down the street... you would not believe the way kids race up and down this road! There for the longest time I wouldn't even let my daughter play in the front yard at all! I had the original bare-bones release of this movie... but being one of my all time favorites.. I was quick to upgrade when the special edition was released. I was hoping for more extras then I actually got... but it is much better then the first release. This DVD contains a Director's Commentary and 3 making of featurettes. As I said... definitely an improvement.. but could have been better. I would have loved to of seen some deleted scenes on here... maybe a gag reel. Of course I have yet to watch any of the extras that is on there.. but I do know I will get to them. OK... that concludes my double feature... when I saw that Denise Crosby was in Mortuary.... there was just no way I was not going to watch both movies. And let me tell you... I really enjoyed this double feature. Any thoughts on either of these movies is welcome and appreciated.